Didn’t you just love the Powerade vending machines in Enter The Matrix? The Target chalet in Shaun White Snowboarding? The Doritos trucks in Ghostbusters? No? 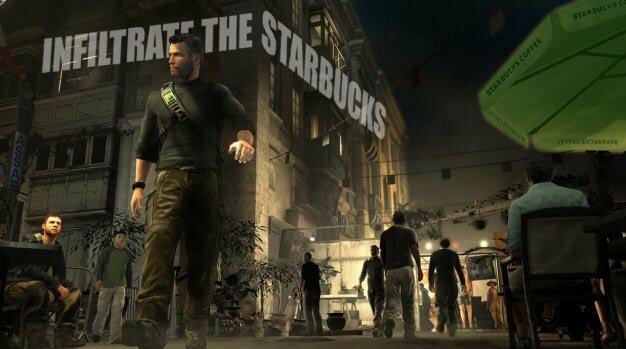 Then brace yourself for some bad news, as Ubisoft will be offering advertisers the chance to pimp their wares in Splinter Cell: Conviction via both static and video ads placed in high-density areas throughout the gameworld. At Microsoft Advertising’s Gaming Upfront presentation, Ubisoft showed potential advertisers “heat maps” highlighting popular routes through each level, in which they will be selling both high and low profile space. Ubisoft’s Jeffrey Dickstein even reportedly said that it would be possible to advertise during the game’s torture scenes, so Sam Fisher could be bashing heads against not just any toilet, but the pristine porcelain of a genuine Kohler! His dead daughter will be avenged with only the finest bathroom fixtures, dammit.